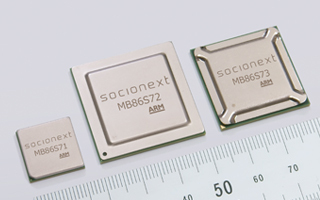 Platform SoCs (General-Purpose Processors) | Socionext Inc.
A platform SoC ("PF SoC") is a general-purpose processor serving as the basis of our system development support solutions, which reduce such customer risks as developmental delays and cost overruns in system development. Thanks to their high performance CPUs and GPUs, as well as a high level of extensibility, our PF SoCs are capable of meeting a wide variety of needs that cannot be met with existing application processors, thereby solving customer issues. With their high performance CPUs and GPUs, as well as high-speed interfaces, this product family offers the best products for developing high performance, low power consumption systems at low cost. We have a product lineup that supports the diverse requirements of office, industrial, medical, and other equipment that cannot be met by current application processors. In addition, we have an evaluation board and software that enable quick commencement of system development. With its high performance CPU and a GPU that supports GPGPU computing, PF SoCs provide a vastly improved software development environment that increases the potential for realizing in software a level of functionality that to date was only possible in hardware. Advances in software-oriented development will not only increase system development efficiency and improve the inheritability and portability of software resources, but will also accelerate the launching of customer products. PF SoCs can also meet requirements related to the enhancement of product functionality through the use of hardware situated outside the SoC in a product's configuration. The PF SoC makes the development of high-performance systems possible thanks to its high-speed interfaces (including PCI Express) whose generous bandwidth prevents bottlenecks in interfaces with custom LSIs outside the SoC. The purpose of our platform software is to increase the cost effectiveness of software development for PF SoC users. In addition to an OS and device drivers, the platform software includes firmware that maximizes the performance of the PF SoC. What's more, it includes OpenGL ES, OpenCL and other standard libraries supporting OpenAPI, that reduce development periods and enhance asset utilization.